Acrylic display case for a standard or taller beanie baby size doll, bear, etc. This is a 2 piece box with a securely fitting lid - top. These cases are stackable for easy storage. Inside dimensions are 3-3/4 x 3-3/4 x 8-1/4. Acrylic display case for a smaller beanie baby size doll, bear, etc. Also the perfect holder for Betta Beta Fighting Fish. Inside dimensions are 4 x 4 x 5. Acrylic display case for beanie baby size doll, bear, etc. This is a 2 piece case that is fully stackable. Image shown with standard clear base. Also available with mirrored base. This is a high quality case at a more affordable price. are 9x 4-1/2 x 4-1/2. Acrylic display case for a single beanie baby size doll laying horizontal. mirror back and floor with black trimmed acrylic base. This is not one of those cheap, mass produced display cases. This Beanie Baby Box is made of high impact, crystal clear polystyrene and features a compression fit lid at the very top of the box. This Beanie Baby display measures 7 inches tall. Includes 1 free nameplate. This Beanie Baby Box is made of high clarity acrylic and features a black base and a clear cover with a mirrored back. Comes with 1 free nameplate. 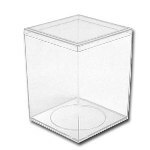 Wall mountable four tier - shelf acrylic case holds multiple items. Great for beanie babies, dolls, bobble head doll, nick nacks, figurines statues, or any other small misc items. The uses for this case are endless. It has 4 shelves that are 19-3/4"L x 5"D x 6"H each shelf. that is able to handle a lock. memorabilia collection. Price includes up to 8 free nameplates. Overall case dimensions are 20"L x 5-1/2"D x 24-3/4"H.
We do custom sizes. Just ask! memorabilia collection. Price includes up to 28 free nameplates. Individual compartment dimensions are 7 "W x 3-3/4"Hx 3-7/8"D.
Overall case dimensions are 29 "W x 24"Hx 4-1/8"D.
Individual compartment dimensions are 3-3/4"W x 7"Hx 3-7/8"D.